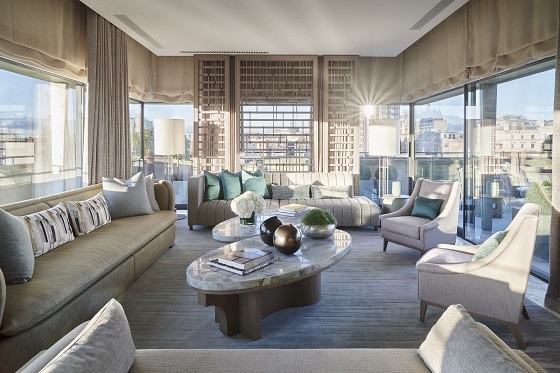 Highly acclaimed designer André Fu and The Berkeley Hotel have collaborated on stunning rooftop suites at classic London hotel, The Berkeley. The high-end suites are a part of a much wider modernisation for the historic hotel. Positioned at the top of the building, and both with rooftop access, these contemporary designs are going to turn heads among the capital’s design elite. Both suites have been created around a glass pavilion, which douses the interiors in plenty of light. Generous terraces surround the suites, and the highly opulent but casual interiors are designed to a muted rock and stone colour palette, with dashes of emerald green and warm terracotta. Scroll down for a full image gallery. The front entrance and two of the hotel’s social spaces, the Blue Bar and Collins Room, have already been updated for a modern audience who prefer relaxed sophistication to a formal aesthetic. The Crescent Pavilion and Grand Pavilion are two of the hotel’s four suites, following the renovation of The Apartment in 2017, by John Heah, and the Opus Suite, which launched in 2012 and was also designed by André. The idea is that the hotel’s ‘Signature Service’ will add to the dramatic feel of the spatially palatial suites. The food of twice-Michelin-starred chef Marcus Wearing can be ordered direct to the room, and an in-room cocktail maker is available on request (cocktail parties on the terrace are possible), along with the rental of things like bespoke Burberry trench coats, and access to a private concierge throughout your stay. Making outdated interiors feel casually sophisticated is André Fu’s stamp. He’s given lifts to Four Seasons Hotel Seoul, The Upper House in Hong Kong, and The Fullerton Bay Hotel Singapore. Positioned on Knightsbridge with Hyde Park views, and within a few minutes’ walk of the area’s shops including Harrods, the two suites are perfectly situated for the best of west London’s luxury spas, shops and dining experiences.